In this hilarious comedic romp, four friends have sworn to keep the promise they made on the night of their Senior Prom: to be in each other’s weddings…no matter what. More than thirty years later, these Southern friends-for-life are still making “the long walk” for each other, determined to honor that vow. Hop on this marriage-go-round for a laugh-out-loud journey with these beleaguered bridesmaids as they navigate the choppy waters of love and matrimony. 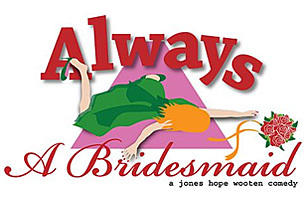 ALWAYS A BRIDESMAID is the rollicking tale of four loyal and determined women who definitively answer the question, “Just how far are you willing to go to keep a promise to a friend?” If you’ve ever elbowed a stranger out of the way to catch a bride’s bouquet, seriously questioned the mental stability of the duo saying “I do” or been forced to wear the world’s ugliest bridesmaid dress, this deliriously funny JONES HOPE WOOTEN COMEDY is definitely for you…and your dearly beloved!